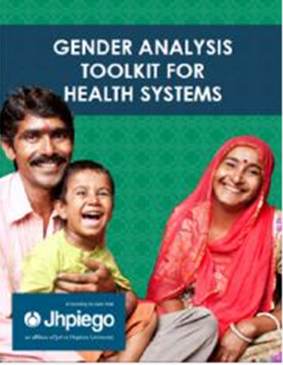 The purpose of the Gender Analysis Toolkit is to provide research questions to guide data collection when performing a project-level gender analysis. The Toolkit provides illustrative questions related to the five domains described in United States Agency for International Development’s (USAID) Automated Directive System (ADS) 205, which are: 1) Laws, regulations, and institutional practices; 2) Cultural norms and beliefs; 3) Gender roles, responsibilities, and time used; 4) Access to and control over assets and resources; and 5) Patterns of power and decision-making. Jhpiego funded the production and publication of this document. Funding from the USAID Maternal Child Survival Program supported the development of select data collection tools and the gender integration framework cited in the annexes. This document was prepared by Deborah Caro, PhD and Caitlin Nordehn of Cultural Practice and Myra Betron of Jhpiego. It was edited by Joya Banerjee and Sonia Elabd of Jhpiego. Layout and graphic design was done by Be the Change Group Inc. The authors would like to thank the following people for their careful review of the document: Michal Avni (USAID), Joan Kraft (USAID), Niyati Shah (USAID), Christina Maly (Jhpiego), Linda Fogarty (Jhpiego), Constance Newman (IntraHealth International), Ashley Jackson (PSI), Elizabeth Silva (Asia Foundation), and Rosemary Morgan (Johns Hopkins Bloomberg School of Public Health).